Teaching your children sign language is a great idea. Not only is it teaching them a new way to communicate but it also helps develop attention skills. As we are entering November and the Thanksgiving season why not teach your kids a new and fun way to express their gratitude. Here's how you say "thank you". Try using this more around the house and out and about. 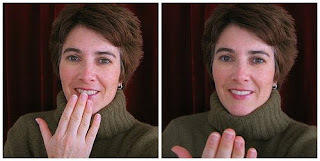 **Remember that just because you are using sign language doesn't mean you can't say "thank you" along with it.